This is a really cute dress with buttons on the front and long sheer sleeves and a cute peter pan style collar. ASOS purple velvet sleeveless skater dress. 90% polyester, 10% elastane. Round neckline. Short length. Stretchy material. ASOS IVORY MIDI DRESS. PLUNGE FRONT. MADE FROM STRETCH MATERIAL. KOKO FROM ASOS CREAM MINI DRESS. RETRO SKATER STYLE. SKIRT PART IS MADE FROM STRETCH MATERIAL WITH SOFT PLEATS. TOP IS MADE FROM LACE AND LINED ON THE TOP LEAVING LONG SLEEVES SEMI SHEER. Ex Asos Teal Green belted Skater dress. Size 4-6 Available. A very good simple dress for an outdoor. UK SIZE 14 EUR 42 US 10. COLOR BLACK. 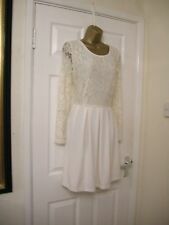 FOR SALE PREVIOUSLY WORN IN EXCELLENT CONDITION BLACK LADIES PARTY CASUAL BARDOT DRESS SKATER ASOS SIZE 10 STRETCHY A-LINE. This can be affected by different light conditions or your screen settings, depending on your local screen settings photos might appear differently as brightness and colour settings can affect their look. THIS IS A GORGEOUS DRESS BY ASOS. IT IS MADE FROM FLOATY CHIFFON. A LOVELY DRESS IT WILL BE A PLEASURE TO WEAR AND CERTAINLY HAS THE WOW FACTOR. SKATER STYLE WITH CUT OUT SIDES. AND PLEAT FRONT. KOKO DRESS FROM ASOS. PLUMMY PURPLE CHIFFON DRESS WITH DROPPED WAIST IN THE FRONT. BEAUTIFULLY SEQUIN EMBELLISHED AND APPLIQUED IN THE FRONT. PULL ON DRESS WITH ELASTICATED BACK WAIST. COLOUR NAVY. UK SIZE 6 34. the colours may change depending on your screen settings, which may affect. of receiving the item, stating the full details of the problem, and we try our best to. 2 cut out sections at the back. Sheer material over a black lining. Perfect for a party or special night out. THIS IS A GORGEOUS DRESS BY ASOS FROM THEIR SALON COLLECTION. FIT AND FLARE SKATER STYLE. SLASH BACK WITH BUTTON FASTENER BACK NECK. A LOVELY DRESS IT WILL BE A PLEASURE TO WEAR AND CERTAINLY HAS THE WOW FACTOR. Asos Floral T-shirt Scuba Bodycon Midi Dress UK10 BNWT. Midi dress by ASOS Collection. The dress is exactly as seen in the asos pictures but the lighting is making the last pictures look different. Kick split. Grey Party Dress Size 10. Condition is New without tags. Dispatched with Royal Mail 2nd Class. Skater dress by ASOS, made from semi sheer chiffon, 100% polyester, scoop neckline, lace-up back, zip back fastening, machine washable, colour in oxblood, available in size UK 8/EU 36/US 4. Skater dress by ASOS, in Pink, with Twist Plunge Bandeau neckline, made from smooth woven satin, Hand wash, available in size UK 10/EU 38/US 6. Made from a poly-blend fabric, Textured bandage design, Sweetheart bandeau neckline, Fit and flare shape, Zip back fastening, Regular fit, Main: 97% Polyester, 3% Elastane, Trim: 96% Polyester, 4% Elastane Lining: 100% Polyester. HERE IS FOR SALE BNWT ASOS DARK BLUE / NAVY LEATHER SKATER DRESS IN SIZE. Score a wardrobe win with this playful skater leather dress from ASOS. It features a sweetheart neckline at the front, sleeveless fitted top and mini skirt. Hot pink dress from ASOS, cape effect sleeves with a deep V back, triple button and ruched layer detail to the waistband. Fully lined. Size UK 10. Material Shell - 100% Polyester; Lining - 100% Acetate.